Low-flow fixtures have been mandated by The National Energy Policy Act. Low-flow fixtures can provide the homeowner with significant savings and be a sustainable measure in your remodeling or construction project. Low flow fixtures such as toilets, faucet aerators, and shower heads, can provide the same utility when compared to non-low-flow fixtures. Low flow fixture manufacturers vary on their technology used, but they can provide with the same results, and new mechanisms are being developed to be used with low flow fixtures. Laminar-flow: Laminar-flow showerhead will form streams of water and will provide with a more accurate temperature control. Aerating: This type of low flow showerhead will mix water with air forming a misty type of water spray. It will create a great amount of steam and moisture, and in humid climates are not recommended. 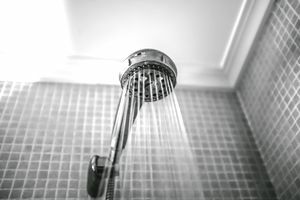 Low-flow showerheads should replace older ones that were designed with a flow rate of 5.5 GPM. Low-flow toilets and ultra-low-flow toilets have been designed to use half the amount of water of traditional toilets. Low flow toilets are averaging 1.6 GPF, instead of 3.5 GPF. The design of low-flow toilets has been under fire due to the claim that some models cannot flush the toilet in an efficient way. Later techniques and toilets performance have been upgraded to relief these problems, and they are designed, the majority, with a half flush option for liquid waste and a full flush for solid waste disposal. Many low flow toilets are also designed to reduce clog problems because their drainage passage is wider. Gravity-Fed Low Flow Toilets: This kind of low flow toilet uses the traditional weight of water to push it down the bowl. They are cheaper and less noisy that pressure-assisted low flow toilets. Pressure-Assisted Low Flow Toilets: This type of low flow toilet is usually noisier but can reduce water consumption by 45% when compared to gravity-fed toilets. This system uses air pressure built up inside the tank to push the water down. Old sink faucets can also be wasting a lot of water and money. You should consider replacing your faucets if it uses more than 2.5GPM. There are a couple of ideas that you can choose from to replace that outdated faucet. You can choose whether to replace it with a new faucet, normally with less than 1.5GPM or by installing an aerator. The aerator or flow restrictor can be added to almost any faucet, providing for an easy and cheap modification that will save you some money over the years. Low-flow fixtures can certainly require some additional upfront cost to procure when compared to traditional fixtures. However, since many building codes require to have low flow fixtures, we have analyzed how much cost will these type of fixtures can add to your construction proposal. Depending on the manufacturer, a basic toilet can cost between $75 and $450, only the fixture. A low flow toilet can easily cost about $100 more depending on the manufacturer, but the payback for that customer could be as fast as three years due to savings on water usage. Available in a wide array of colors and styles. Water-efficient toilets save money on your monthly water bill.